For a week in the summer of 2015, Rohana Mayer traveled to Armenia, the homeland of her beloved Armenian Gamprs. Recently, I interviewed her about gamprs and her trip. I have quite enjoyed getting to know Rohana over the last while since she traveled abroad, and I thank her for her candor and thoughtfulness in the following conversation. If you’d like to read more about Armenia and Rohana, refer to my previous post here. Direct contact information follows the interview. What precipitated your interest in being involved with the preservation of the Armenian Gampr? A person I knew dropped off a male gampr imported from Armenia with his pedigree at my house, when his wife was angry that he had brought the dog home and told him to get rid of it. So he left Lao of Etchmiadzin with me. I was taking a semester of courses at the time, and had to write a paper, so I chose to investigate the gampr and write about their history. I received a letter from the teacher telling me it was excellent and ought to be published. So I posted it to a website. I began receiving hate emails, including death threats from Turkish people. I also received an abundance of thank yous from Armenians. I found it inspiring, and have continued as I am today. Further back, I grew up in the mountains of Big Sur with an eccentric father. He taught us to disdain anything that was weak and soft, such as city pets. When we did, rarely, see city-slickers with their soft pudgy co-dependent dogs, or heavy graceless cattle, it was a sharp contrast to the wild animals we were used to. Once, a stray dog, likely off the highway as the rest was all wilderness, happened to stop at our house for a few weeks. He was lean and fast, very fit and alert. I felt that he was much closer to how dogs SHOULD be. Growing up on stories by Jack London reinforced the concept of the ideal dog as something closer to a wild animal, but still a companion. Of course as an adult who has long since left Big Sur, I do not have the same attitude toward domesticated animals. When I learned about the gampr, though, they fit the childhood ideal of what a dog should be: partly a companion, not so clearly emotionally dependant, very fit for survival with instinct intact, partly wild. The fact that this has remained a part of them for thousands of years of domestication fascinates me. Can you tell me a bit about the gampr and what makes them unique? The gampr is the product of over 10,000 years of domestication, but still close to it’s proto-dog and a little Caspian wolf ancestry. It has not changed a whole lot, although the republic of Armenia has gone through intense changes. Their temperament and behaviour is quite similar to other landrace LGDs of the Caucasus and Central Asia, but because of the length of time that the Armenians managed their dogs, the highly evolved nature of their culture, and the variations of kingdoms and social needs, the gampr has several varieties within the landrace that have been bred for special skills. The various strains all contribute to the current cluster of dogs found in Armenia; however, the Hovashoon, or Chobani shoon, appears the most untouched by modern breeding practices. You run the Armenian Gampr Club of America, whose website states that the Armenian Gampr is still very much a landrace, with all the benefits of genetic diversity that implies. Can you tell me a bit more about what this means and why it’s important? Landraces are not defined within a narrow scope, such as a standardized breed like the Doberman Pinscher, which has a specific use and type. Because of its genetic diversity, a landrace has an inherent adaptability to its culture of use and physical environment. If the gampr could not adapt and retain usefulness throughout the changes imposed upon its human counterpart, it would not exist today. In order to preserve adaptability, it is necessary to also preserve heterozygosis. Natural health also relies on genetic heterozygosis. The more inbred a dog is, the less likely the immune system will have the variability needed for response to a wide range of diseases. Some standardized breeds are so encumbered by illness that they are dependent on ready access to medical care. A dog whose primary job includes working in remote mountains in an impoverished society would soon become useless if it could not thrive long without vet services. In the gampr we have the raw material that created so many other breeds. Refined, it can become many things. But as it is, it can produce great variation that can be selected and specialized. To me, that is very interesting. One of the goals of your club is to help place Armenian Gamprs with farmers and ranchers here in North America. What is some of the feedback that you’ve gotten about the dogs that you’ve placed here? One of the most common responses is that the owners are very happy the dogs can begin work at a young age, and take their job seriously. When alone, they have an adult demeanour and take on responsibility fairly young, although it does help to have an older dog support their learning process. Most American farm owners are fairly happy, although we have had a few dogs who didn’t work out – as in any breed of livestock guardian. For example, two young females are in Nevada on a large farm. They are now breeding age, and the locals who have Great Pyrs are so impressed they regularly ask when there will be pups available. Predator pressure has apparently increased there. The owner has orders for 20 pups already. This is due to the wide range these dogs cover, working as a team, and how well they monitor and care for all the local stock, including witnessed accounts of physical attacks on coyotes. Not all gamprs have been that successful. There have been a few who have eaten chickens relentlessly, a couple who wander too far, but mostly we are doing well. In the past I had much more limited access to quality breeding dogs, but now we have more to choose from. I have not placed them in situations where they’d be isolated with livestock, I prefer them to interact as the farm person’s partner, and they do well in these situations. The methods that originated in Coppinger’s work are inappropriate, and once people see the complexities of the relationships that are developed, they understand how much more these dogs can be. What is one of the biggest challenges you face in getting these dogs to the people who want them? I am on the west coast, as are most imports, and we are not along most of the available transportation routes. So, when it comes to puppies, it usually takes a month longer than we expect to actually get them to their new homes. If it’s an adult that needs rehoming, I’ll usually take the dog to my house for an adjustment period. Most rehomes are out of Los Angeles, where there are a half million Armenians. Sometimes the dogs are not socialized, are over-sensitized and over-reactive after living in small spaces where they cannot express their instincts. These dogs are bred to intensely follow their instincts over training. In Los Angeles, there is actually a lot of nighttime activity and the dogs get very frustrated without the ability to patrol and secure their area. So, I basically just acclimate them to a larger space, pack life, and evaluate their ability to be with livestock. Then we work to match them with the right home. 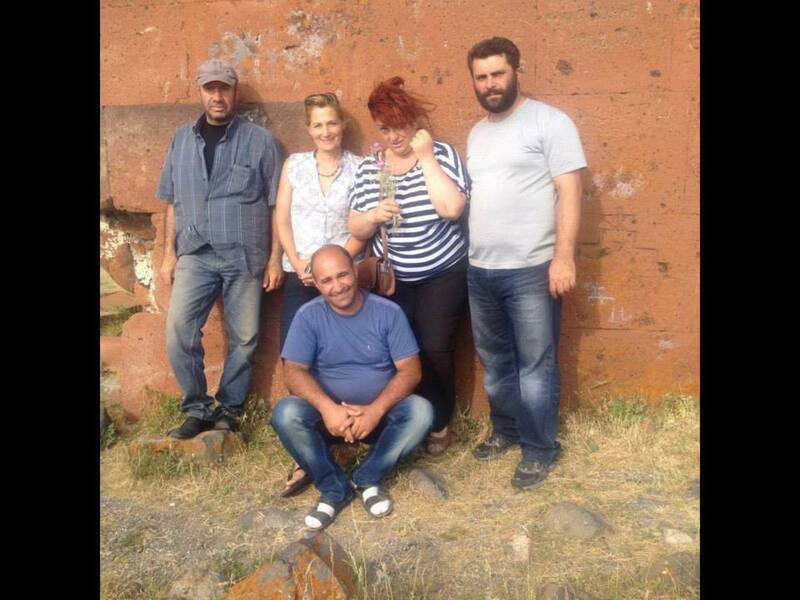 Recently you took a trip to Armenia with the goal of collecting DNA samples of as many gamprs as possible. Why did you do this? There were several reasons for taking the trip. Personally, I am hoping to show any relationship to proto-dog DNA and that of local wolves, as well as to show in which portion of the gampr gene pool it is the highest. I’d also like to have some sort of breed profile created, if possible. One of my original goals was to start collecting paternity DNA, but currently it’s difficult to predict which will have offspring sent to USA. I hope that any genetic anomalies we find in the future can then be traced back. I am also curious as to what the level of heterozygosis for the breed is, in general and within certain types. 7. 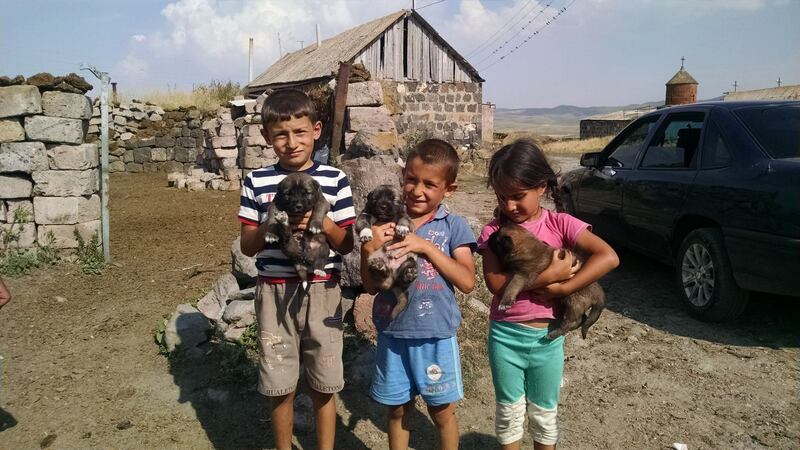 You traveled over a great deal of western Armenia, meeting many people and their dogs. Can you tell me about the ones who stick out in your mind? I covered most of the western third of the country, although I missed one of the most significant breeders. I think I have a long list of those who made an impression, in just one short week. Vahan Mkhitarian, Armen Simonyan and Vagarsh Gasparyan were the three main breeders I spoke with, who were actually serious breeders. I would love to spend a full week with each of them, just to see how they evaluate dogs, why they choose what they do etc. They were all charming and enjoyable company as well as very sincere and kind people. I met Tigran Nazaryan, which I have wanted to do since I began this project. He published gampr.net , the first website to ever specifically focus on the gampr. He was one of a small group of students selected for their brilliance for a full degree at UC Berkeley when Armenia gained its independence in 1992. He returned to Armenia and among other things, began the gampr project that I now continue, in my own way. He is a fascinating and unique person. It took a couple of hours to get him warmed up on the subject, which has been muddied by conflicts over which type is better or more correct, and fighting about dog-fighting. Many of the original people involved are no longer interested for those reasons. Once we had talked for a few hours, avoiding the subject directly, Tigran became more animated and excited. It is the subject of the mind of the gampr, not the physique or history, that interests him. We talked until almost 2 am, during which time he introduced me to his neighbour who specifically breeds just huge mixed fighting dogs. A sweet man who loves all of his 40+ dogs, the neighbour Mushegh also had some interesting anecdotes about all of the breeders I had met, and their dogs. Everyone is connected, as it is a small country. I also met a member of a Yazidi chief’s family, and he was impressively noble, charming, firm and kind all at once. He was kind enough to give me a puppy. The food was delicious, the people very charming and exceptionally hospitable. I felt very welcomed wherever I went. The night we left Tigran’s house, I arrived to my apartment and realized I had left my phone charging cord at Tigran’s. I walked around Yerevan hoping to find an open store that sold the cord I needed. Armenians are somewhat nocturnal and many stores were still open. I gave up after an hour, and asked a nearby cab driver where there was a cell phone store that I could go to in the morning. He motioned me into his car and dropped me at an open cell phone boutique store – still open at almost 3am. He refused a fare, walked me inside and said something to the woman at the counter. She smiled, walked to a back room and brought out a phone charger that worked for my phone. She plugged it into a wall outlet and motioned for me to sit at the couch and charge my phone. I did for a little while, and noticed a unit for sale that had about ten plug options, one of which would work for my phone. So I bought it and walked home, although they seemed happy to have me just sit and use their charger temporarily without a purchase. Very accommodating and kind! While you were overseas, you posted pictures of some places where the dogs were being inbred in an attempt to preserve purity. Why do you think this happens? What are some of the consequences of this type of breeding that you saw? I think it is partly a fear of their own dogs being crossed to something that will not work well, as happens frequently during winter stays in villages, and also likely an extreme interpretation of ‘purity’ by linebreeding left over from Soviet cynologist training. Some of the effects we saw were dwarfism, loose/hanging eyelids, generally more petite structure, and liver coloring. The Armenian Gampr needs the continued support of dedicated and knowledgeable breeders and advocates to keep it from disappearing into other breed populations that are not being kept up as efficient working dogs. If there is one thing that the clubs trying to help this happen need right now, what would it be? Generally, we need people to understand population genetics with the intent to conserve working ability, which includes correct physique (not overdone), correct mentality, and reliable health. So maybe that is three or four things. But it’s not simple. We also need monetary support, as most clubs do. Some of the projects we have undertaken are costly and won’t be able go ahead as much as we’d like without direct support. One thing we would really like to do is upgrade our pedigree software, which will cost about $200 US. We are working on some fundraising ideas to help make this happen. Rohana shows the envelope for the DNA sample. In our conversations, you’ve mentioned several times that this trip would not have been successful if it weren’t for the help you received from breeders and farmers in Armenia. Can you tell me a bit more about these people and how invaluable they were to you? Is there anything you would like to say to them? The breeders I mentioned above, and their associates who had fewer dogs (they all have people with just a couple dogs who are semi-co breeders.) all took at least a day, mostly took several days to tour with me, answer questions, help collect DNA, and they listened with an intent to understand. Violetta Gabrielyan, president of Kinologia (www.kinologia.am) arranged four days of meetings and tours. She took time off work, which I think cost her, and arranged for us to be videotaped. In between, she made an appearance on one of the news channels. The entire trip was paid for by Father Avedis Abovian – my airfare, apartment, our fuel, food. I raised a litter for him and helped care for his dogs while he was away, and he definitely more than compensated me. Overall, it seemed that everyone sincerely wanted to share as much accurate information with me as possible, in order that I find whatever I needed; I think they were all unsure exactly what was on my mind. Violetta told them I was there to ‘prove’ gampr DNA, as if it was a service to her program. I think she told them that I needed to see as many unrelated dogs as possible, and of course I was shown the more impressive ones. The breeders could tell by the translated conversations that I was not entirely sure about Violetta’s procedures but wanted more information than I was presented with, about their dogs. They were curious but skirted the issue directly when she was present. When she was not with me, one of them let me know he only sells a few puppies through her, and that he basically does as he wants, as they all do – she is just another option available to them. There is definitely a lot more to do in order to create a better information exchange, and the language is just one of the barriers. Armenian dog culture has been evolving for literally over 4000 years; I was at an archaelogical site where dog breeding had consistently been embedded in the culture from 2000 BC to CE, so the situation is full of entangled history, varieties, and practices that are not what an American would expect. This doesn’t even touch on the wealth of shepherd’s dogs that are spread across the mountains, related to the dogs in each kennel through exchanges of puppies. It would be a grave mistake to assess the entirety of the breed based on what is in each breeder’s group of dogs; the backbone of the Armenian Gampr are the working dogs in the mountains. Overall, I was happier with the quality of the dogs than I had expected to be. The kindness and hospitality of the Armenians were delightful. Of course I still have a lot of questions, and I expect I’ll return next March, if not sooner. ***To contact Rohana directly, use the contact information on the front page of the Armenian Gampr Club of America’s website. Categories: LGD General, LGDs Around the World, Uncategorized | Tags: Armenia, Armenian, Armenian Gampr, Armenian Gampr Club of America, farming, gampr, LGD, LGDs, Livestock Guardian Dog, Livestock Protection Dog, mountains, rancher, rohana mayer, Shepherd, Transhumance, working dogs | Permalink. 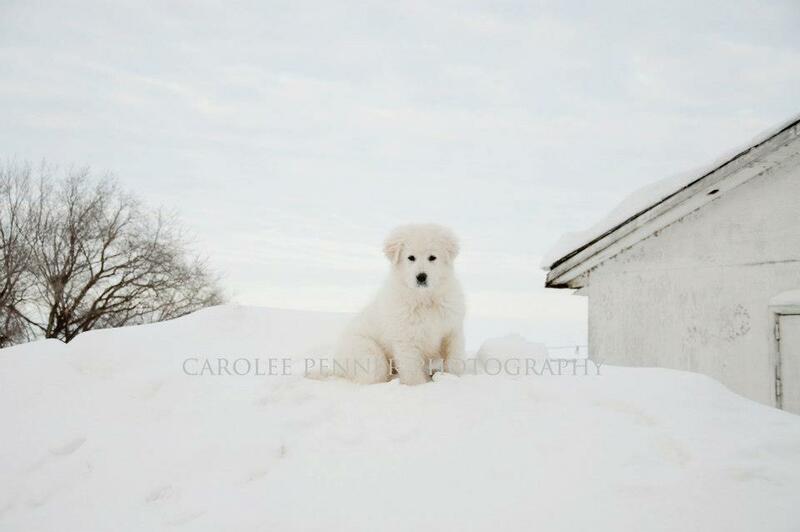 Shortly after we got our first registered Maremma pup, I remember thinking that it shouldn’t be this hard. She was a singleton, from an unplanned litter where the other pups died due to neglect, born to a mother who was under a year. She’d not been socialized off the farm and showed up as a little spitfire wrapped in a coating of uncertainty. When we picked up our pup, her mother was confined in a small pen with wire over it. She presented as a bundle of busy energy, wriggling in submission, looking for a release from her prison. She washed out as a guardian after more litters and before she was 3. Her mate was the complete opposite at less than a year – trustworthy, confident, imposing, wary. He sniffed my hand and looked me over as if to say “I’ll let you stay, for now”. I loved him and hoped that his pup would take after her father. The breeder had spent the money to bring one parent from the US and the other from a couple of provinces over. She had a contract, centered mainly around breeding rights. She looked surprised when I mentioned the importance of health testing. Her sheep operation was well set up, clean and carefully run. This was no puppy mill, but neither was it a place that had what it needed to choose the right dogs or do what was right for them in the end. I sold her at near maturity to someone I trusted who promised to stay the course with her, but instead dumped her in rescue after a couple of months. That’s a whole other story for another time – how this rescue stayed hidden and refused to return her, how her new owner had gone against our agreement… and the reason why I’ll never again sell an adult LGD who needs special handling. There is not a day that goes by that I don’t whisper an apology to her for letting her down again Before I rehomed her, I’d cried a river of tears over her heightened prey drive, her willingness to body check anyone to get what she wanted, her unwillingness to listen when it didn’t suit her. As a young pup, she ate – ATE – stuffed animals, toys; if it was fluffy, she’d gulp it down. At least three times we were ready to head to the vet to open her up, one foot out the door, when she threw up the item in question. Once, she was off food for 2 days. When she finally threw it up, a long rag she’d found and shredded, she gobbled it down again. I was a wreck. She was a busy, busy dog. I’d been led to believe that LGDs were meant to be placid and thoughtful a fair bit of the time, and that had been our experience up until then. I was on a forum that was run in part by people who purported to have seen all and done all; they recommended I put her away when she was badly behaved and to only reward the behavior I was looking for. She would have been put away ALL OF THE TIME. I attached a tire to her on their advice, after trying a dangle stick that did nothing at all to stop her chasing or even slow her down. The tire only made her more determined and she developed a bowl legged walk to compensate. I was told not to exercise her out of the pasture, to only train her in there, to have “everything good happen in with the stock”. Well, she was so squirrelly after a few months that the stock wanted nothing to do with her. We didn’t have a hundred acre pastures for her to get her wiggles out. Prolonged confinement made things worse, as it will do with a needy, active pup. Even though she responded well to positive reinforcement training techniques, rewarding her with food in the pasture only served to make her possessive. One day, when she was just over a year old, she launched herself at my older teenaged daughter, knocking her over to get the food bowl in her hand. I was no slouch with this dog, we’d followed a strict protocol of waiting for meals to ensure building self control. Clearly I was on the wrong track. I was definitely not breeding this dog, and I was more than done with taking certain advice. This was a registered dog. This was what I’d been told to look for. I was finished listening to others – it was far past time that I listened to myself and what I knew to be true. 1. No serious producer has time to hold the hand of a working guardian dog every step of the way for years. Breeding decisions need to keep this in mind. These are dogs with a purpose, and that purpose needs to be protected in the genetic material being used. 2. Fair corrections ARE appropriate for working LGDs. For some dogs this may only need to be a verbal sound and a sharp look, while others need more. Some dogs will hardly make a mistake, while others will go through periods where they make one with every breath. Setting out on the right foot, being crystal clear with these dogs is worth far more to them than the fallout that comes from over isolating, tethering for long periods or ignoring their clumsy attempts to interact. Tell them what you want and tell them what you don’t want. They’re not mind readers, after all. Set them up for success and then expect great things of them. 3. Don’t buy into this idea that only registered dogs are worth anything. Papers mean nothing when it comes time to work. Both of my full time working dogs aren’t registered and I wouldn’t trade either of them for truckloads of gold. Take working dogs on their merits, not on their pedigreed status. Anyone who tells you otherwise is only trying to make money from you. Registered doesn’t mean health tested, registered doesn’t mean that the dog is more likely to work well for you – but registered always means you’ll pay more and be more financially invested in that product of untested parents who won’t guard for you. You’re much more likely to make the decision to breed to recoup some of that investment. This is not to say that registered dogs don’t work – but it doesn’t ensure that they will. If you go that route, read your contract carefully. Promote health testing, temperament assessment and maturity before breeding regardless of registration – be a part of the solution for all working dogs. 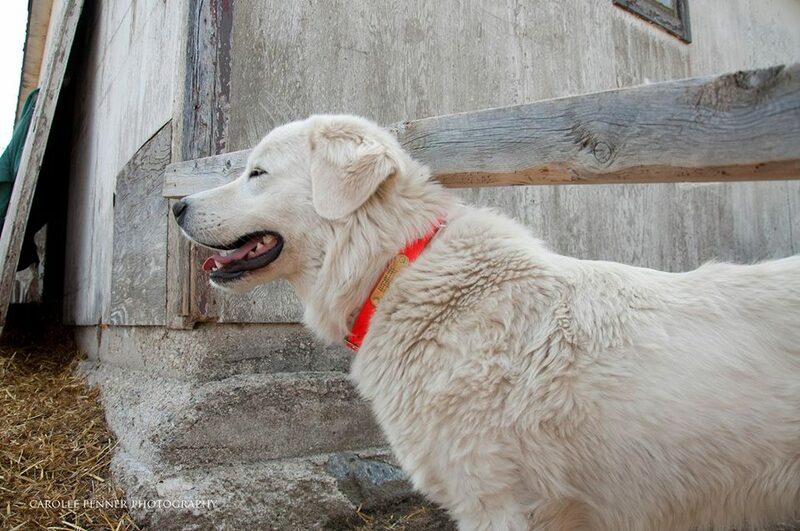 By the time our Maremma girl left our place, she was well in hand and only getting better every day. I stopped outsourcing my decisions and started giving her the feedback she needed. It would have been a thousand times better and more fair to give it to her as a young pup, but this is all a part of the learning curve – especially in a world where we are encouraged to listen to all the “experts”. She was spending more and more time in with the stock and behaving well. I can only hope that wherever she’s ended up, she ends up as happy as she was before she left us. Categories: LGD General, Uncategorized | Tags: LGD, Livestock, Livestock Guardian Dog, Maremma, registration, working dogs | Permalink.